Something is not quite right with the UK’s nuclear power plans, as this Click Green exclusive shows. Anti-nuclear legal action by Austria and reports of serious technical issues can’t be helping the cause. The UK’s nuclear watchdog has stopped safety inspections at the planned site of the Hinkley C nuclear power station after EDF Energy ordered a stop to all groundwork, ClickGreen can reveal. Despite recently publishing a list of preferred suppliers for the £24 billion project, the French firm were in behind-the-scenes talks with the Office for Nuclear Regulation (ONR), during which they informed them of their decision to mothball the site. 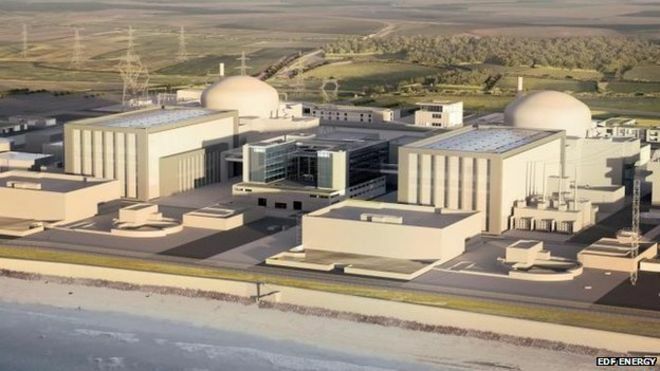 In April, bosses at contractors Nuclear New Build Genco (NNB) – a consortium including EDF Energy, China General Nuclear Corporation and investors – introduced a spending cap because of uncertainty surrounding the Final Investment Decision. Preparations for construction continued to move forward, but all work has now been stopped and the site has been placed in a state of “care and maintenance”. Hinkley C is supposed to be the first new nuclear plant in the UK since the 1980s and is scheduled to start producing electricity in 2023. EDF, however, is still negotiating with Energy Ministers about Government guarantees for the project, along with decommissioning costs. A statement by the ONR confirmed: “Until it is ready to fully remobilise the project, NNB GenCo is retaining a core capability to maintain oversight of the continuing programme of activities associated with development of the detailed design, production of the Hinkley Point C site. “ONR is monitoring the impact of the budget constraint upon NNB GenCo Ltd’s competency and capability. Furthermore, ONR inspectors continue to engage with the programme of design and safety case activities so that ONR is ready to respond when NNB GenCo decides to fully remobilise the project. ONR said it had taken the decision to suspend the production of future inspection reports until after NNB GenCo has made its Final Investment Decision and is ready to remobilise the project. A DECC Spokesperson commented: “The UK Government and EDF are continuing to work together to finalise the project. An announcement on the Final Investment Decision is expected later this summer. Original report: Exclusive: EDF Energy mothballs planned Hinkley C nuclear power site > National News > News | Click Green. ‘Value for money’ is hard to measure in the nuclear industry with the very high cost of decommissioning. First, ONR choose a now useless reactor design thus proving they know little or nothing about nuclear power generation. Second, this was on the cards the moment that the government started talking about reducing subsidies for power. Nuclear power plants do not need to cost so much to build. Most of the excess cost is from the fact that regulations are piled on regulations that are piled on regulations, The ONR lives for paperwork, that is why EDF got the contract in the first place – being French they live the the French bureaucracy and its love of paperwork, every paper generated needs a paper to support it through to the Nth generation and could therefore bulls**t the paper loving ONR. You only have to look at the outstanding paper trail for the Westinghouse design to see that, most of what they are asking for is complete bull – a civil servant looking for job recognition and advancement. Oh Dear, Europe wide blackouts in the next 10 years will be common place. They are behind with their smart meter- turn you off when we want-rollout and now their only backup plan to support the grid from ruinables. I agree with Ivan. This is a dinosaur of a design. Unfortunately both DECC and Ed Davey are incompetent and were naive (or criminal) in agreeing the project at a huge price. ONR sure love to expand their activities (like all bureaucracies) and add unnecessary regulation on unnecessary regulation. It is now almost past the time when this country’s energy policy can be made sensible again with a long term plan to keep the lights on. The ONR should be told to rush through their assessments of the AP1000 and ABWR designs and licence them. All subsidies to ruinables should be stopped immediately and money should be put into developing modular reactors and thorium reactors. It won’t happen with this Government though. When governments get involved in industrial ‘development’ taxpayer money vanishes fast. It would be nice to think the the G are working round to getting out of the ‘Deal’ which was presented as being so ‘Good’ back in the days of coalition ? Fracking should change the picture entirely, and no doubt the Tory’s dont want to be the ones saddled with what in 5 or 6 years time will have become a fabulously expensive white elephant ? ‘Originally scheduled to start operations in 2009, recurrent delays have plagued the project since the beginning, following a series of technical and safety setbacks.